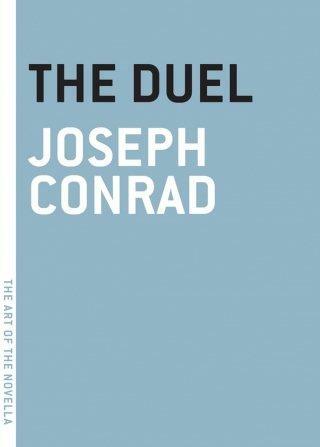 Melville House offered a free e-copy of Conrad’s novella, so I grabbed the chance to read it. 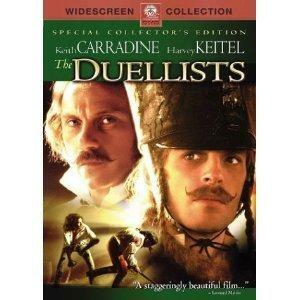 Conrad’s The Duel was made into a marvellous film directed by Ridley Scott, called The Duellists. Regular readers of this blog know that I am fascinated by the film-book connection, and I am also fascinated by duelling, so this novella appealed for dual reasons…. The novella begins during the Napoleonic wars and concludes with the restoration of the Bourbons in a post-Napoleonic France. Tumultuous years indeed for men who fought for the emperor, but also some rather dodgy times when Napoleon was exiled, returned to fight again, and then was finally defeated at Waterloo. A disaster, of course, to bet on the wrong pony, but then again some people go with the flow, and that brings me back to The Duel. The Duel charts the relationship between two officers in Napoleon’s army. These men are cavalry officers and complete opposites in temperament, appearance and background. The two officers are Feraud and D’Hubert–both lieutenants in the Hussars when the story begins in Strasbourg. D’Hubert, a dashing, tall, lithe young man from a wealthy prominent family has already been selected from the herd for special attention. He’s “attached” to the general in command and serves as an officier d’ordonnance. Even at this early stage of his career, it’s easy to see that D’Hubert will be successful–if he survives–his selection denotes the recognition of his talents with the Hussars. He’s a trusted aristocrat and he’s given duties that require a touch of diplomacy. The trouble begins when Lieut. D’Hubert is sent to talk to Feraud regarding a rumour afoot that Feraud dueled with a civilian and “ran that civilian through this morning. Clean through, as you spit a hare.” The civilian is from a prominent family, and Feraud, whose conduct is considered “positively indecent” has angered the general. D’Hubert has been sent to place Feraud under house arrest–partly for his own safety and partly to let the situation cool down, but he finds Feraud already gone from his lodgings. He’s off flirting at the home of a home of a notorious young matron. Astonished at Feraud’s cheek, D’Hubert hustles off to the home of Madame de Lionne to place Feraud under house arrest. Was I to let that sauerkraut-eating civilian wipe his boots on the uniform of the 7th Hussars? This first meeting sets the tone for the relationship between the two men and also outlines their basic personalities. D’Hubert obeys the orders handed down from the general without question, and Feraud, who’s impulsive and hot-tempered, inherently listens to other ‘codes’–other rules that are deeply ingrained in his nature. Feraud’s loyalties run deep and political expediency is an anathema as he operates on passion rather than logic. It’s fairly easy to predict that D’Hubert, the recipient of gilded patronage will go far while Feraud, a Gascon commoner will ultimately sacrifice career to his notions of loyalty and honour. This was most unsuitable ground, he thought, keeping a watchful, narrowed gaze, shaded by long eyelashes, upon the fiery stare of his thickset adversary. This absurd affair would ruin his reputation of a sensible, well-behaved, promising young officer. It would damage, at any rate, his immediate prospects, and lose him the goodwill of his general. These worldly preoccupations were no doubt misplaced in view of the solemnity of the moment. A duel, whether regarded as a ceremony in the cult of honour, or even when reduced to its moral essence to a form of manly sport, demands a perfect singleness of intention, a homicidal austerity of mood. And so begins the long-drawn out conflict between D’Hubert and Feraud. The two officers fight in Napoleon’s campaigns, and in between campaigns they meet and conduct a series of duels. Distance, war and even rank intervenes–duels are only to be held between those of equal rank, so when D’Hubert is promoted, he cannot be challenged by Feraud. While this is essentially a story of two men who battle out their differences using a variety of weapons, this is also a story of two men cast together by circumstance. Feraud appears to take umbrage at D’Hubert’s existence, and part of this must certainly lie in the fact that D’Hubert, one of “these generals’ pets” leads a life of privilege. This is noted by Fearud immediately through the general’s preference for D’Hubert, and this privilege continues to emerge as France’s rulers shift. D’Hubert’s armour of privilege, sensed by Feraud, comes to full bloom with the defeat of Napoleon. Underneath the quarrels, the bravado, the duels, and the misplaced sense of honour, Conrad seems to broach the question: who is the better man? D’Hubert whose cool head and privileged position allows him to remain in favour even as the tide turns? Or is Feraud, the hot head, the better man for his placement of insane loyalty over his own hide? And thus ended this long-protracted affair. Surely none but Frenchman would have carried on such a tragicomedy for so long a time. On a final note, the coterie of disappointed, bitter Napoleonic soldiers surrounding Feraud reminded of Philippe Bridau in Balzac’s The Black Sheep. Although the latter really is a much nastier piece of work. I’m decidedly interested in this one. And in this edition, it seems well done. I also wanted to watch the movie since you first mentioned it only I cannot find it anywhere. I’m suprised Conrad chose such a French theme. I found the film on Amazon UK. It’s very well done, and seems to have faded for some reason. It would fit well with your film blog now I think about it. That’s what I thought. I think I checked on amazon uk. I just saw I got Kleist’s The Duel. Like Caroline, I’m surprised that Conrad chose that theme. The “sauerkraut-eating civilian” expression made me laugh. They’re really in Alsace! You still have to read the Kleist now. That is a good idea, and I will have a look at this book as I haven’t read any of these. I thought I’d read Chekhov’s The Duel, but then I realised I was thinking of Pushkin’s Eugene Onegin, which was about a duel but wasn’t called The Duel 🙂 Thanks for the review! I’ve read 4 of the 5 (all but Kleist) and the other reviews are here but the link feature isn’t working. very proud you listed me under amigos but could you please change the name to MACUMBEIRA, thank you ! Hi Guy, Hi all, I am searching for a duel story that takes place in a pitchdark room. Any idea who could be the author? My father tought it was one of the Munchhausen stories, but I can’t find it back. I did order this set, for the sheer delight of entertaining visiting bookshelf scanners with five volumes of the same design and title, but widely varying in width. They have only been in place for a month and already I’ve had two people pulling them off the shelf to figure out what was up. Oh…and to read them as well. Your commitment to “the duel” shows in the fact that you have now read and reviewed four. I’m impressed. I wished I’d had the Melville House editions for the others to be honest as the extras are well worth a purchase. Kuprin’s The Duel is amazing. I must get this set. I was very close to the end of another book today, so I wanted to have something short with me if/when I finished so that I wouldn’t be stuck. I picked the Penguin mini of Conrad’s Youth: superb. This is a stunning idea. Is the Kuprin the same translation as the one you read do you know? Anyway, I’ll have to get this. This leapt out at me: “a homicidal austerity of mood”. I tend to title my reviews with a quote from the book. That would make a perfect title right there. A lovely turn of phrase. But then, Conrad, so it would be. Melville House have clearly done a really nice job with this series. It’s tremendous actually to see imagination in publishing. Their whole novella series though is worth watching. They have some good titles and the production qualities are very high. Wow thanks for sorting out that mistery Guy ! I am still looking for it in my copy of Munchausen. I read this recently and really rather liked it. The Melville edition is excellent too for the supplementary materials you mention. I was struck, shocked really, by how many duellists were basically just brutal serial killers. Incidents where a skilled duellist would just insult a random stranger so they could have the pleasure in killing them, or the general who after his youthful opponent misfires slowly walks up to him, presses his gun against him, says “I feel sorry for your mother” and only then kills the young man he’s facing. It was horrific. The film too was very good, making I think just enough changes to keep the spirit but make what’s quite an internal narrative work when all one has is an external perspective.